KUBINKA /Moscow Region/, January 23. /TASS/. 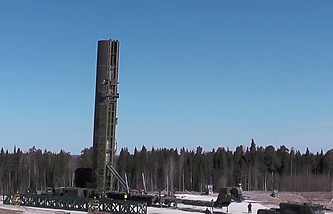 Russia’s new 9M729 missile of the Iskander tactical missile system has a range capability of 480 km and does not violate the Intermediate-Range Nuclear Forces (INF) Treaty, Chief of the Russian Missile and Artillery Force Lieutenant-General Mikhail Matveyevsky said on Wednesday. The general made this statement at a news briefing for military attaches, Russian and foreign media outlets on the new missile. 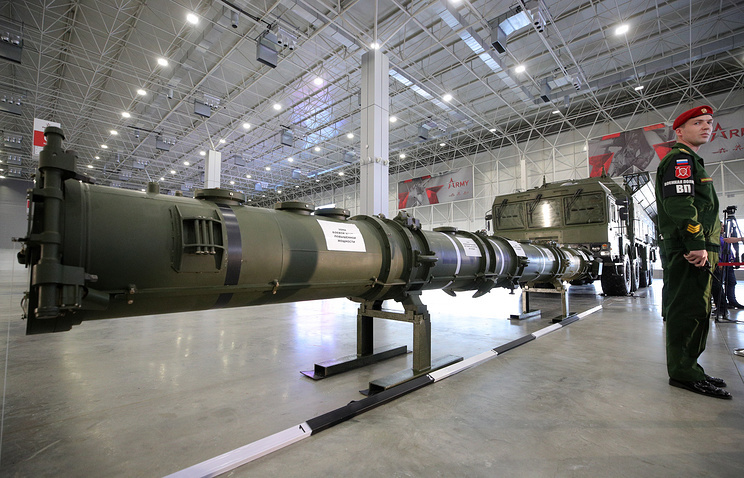 "The 9M729 missile carries combat equipment with the enhanced capacity and the new onboard control system, which provides for the higher accuracy of the missile’s strike," the Russian general said. "The warhead and the control system have been finalized and the missile’s length has been extended, which has increased its weight," Matveyevsky said. "As a result, the maximum flight range of the 9M729 has decreased by 10 km compared to the 9M728 missile and equals 480 km," the general said, adding that this range was confirmed during the Zapad-2017 (West-2017) strategic command and staff drills. The 9M728 and 9M729 missiles are furnished with the warhead and supplied with fuel only in factory conditions. The fuel mass provides for the maximum designed flight range limited by the INF Treaty, the Russian general stressed. The missiles are delivered to the troops in special containers. The fuel mass cannot be changed and the missile cannot be refueled in the troops, Matveyevsky said. "In the troops, the missiles are only stored and maintained on their launchers and maintenance work is carried out on them," the general stressed. The 9M729 cruise missile is a modernized version of the 9M728 that makes part of the Iskander-M tactical missile system. The new missile was developed by the Yekaterinburg-based Novator experimental design bureau. The missile features a more powerful warhead and a new control system to increase the accuracy of its strike. The 9M728 and 9M729 missiles are standardized by most of their assemblies. 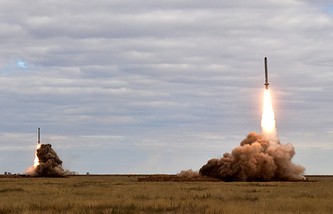 The United States claims that the 9M729 missile has a range capability that exceeds the 500 km limit stipulated by the INF Treaty and demands that Russia eliminate all these missiles, threatening to withdraw from the treaty. Russia has numerously rejected these claims, saying that the new missile does not violate the INF Treaty with its range capability. Only intercontinental ballistic missiles (ICBMs) launched from the Kapustin Yar proving ground had ranges greater than 500 kilometers, he said. Matveyevsky recalled that the United States suspected that 9M729 missiles had allegedly been launched from Kapustin Yar. He said that in 2008-2014 a total of 100 missiles of different types were launched from that proving ground. "All surface-to-surface missiles launched there had ranges below the restrictions imposed by the INF Treaty. The launches of strategic missiles were the sole exception. Notifications of all of them were made to the United States under the 1982 treaty," he said. The Intermediate-Range Nuclear Forces (INF) Treaty was signed between the former Soviet Union and the United States on December 8, 1987 and entered into force on June 1, 1988. The INF Treaty covered deployed and non-deployed ground-based shorter-range missiles (from 500 to 1,000 kilometers) and intermediate-range missiles (from 1,000 to 5,500 kilometers). On January 15, Russia and the US held inter-agency consultations on the INF Treaty in Geneva. Washington again accused Moscow of breaching the arms control agreement. The US threatens to leave the treaty on February 2 unless Russia destroys its 9M729 missile, which allegedly violates the agreement. Russia told colleagues that during the Zapad-2017 drills on September 18, 2017 this missile was test-launched at the Kapustin Yar proving ground at its maximum range and it covered less than 480 km.